Do you have a bunch of leftover wrapping paper left from the holidays? I always end up buying new wrapping paper each year and then I'm left with rolls that never get used. 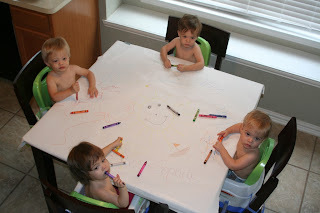 This weekend, we used some of it up and taped it over our entire kitchen table and let the kids practice using crayons. Most of the coloring was on their teeth but they'll get the hang of it and we had fun coloring with them. Have other ideas for fun with wrapping paper? Send them my way - we're always looking for fun things to do around here with things we already have around the house. Keep the colored wrapping paper! Use it crayon side out to wrap birthday gifts! I am loving the expressions on their faces! Crayons are always good for a snack too, just ask my K's. (They must eat them, because we can never find them) Looks like great fun for all. Much love. What a great idea. Finley got those big Tadoodles thingies for Christmas but he just throws the paper and chews on the crayon. Never thought of taping wrapping paper down. Genius! Love the pics & great idea. As for other ideas, have them rip the paper or try and make paper balls. Both are fabulous fine motor skill tasks & really help for future hand development & dexterity skills. i tell ya what...i'm just going to start calling you, "lil miss martha stewart"! LOVE it! great idea! and thanks for the book--totally going to try to go get it tomorrow! What is it with toddlers & the taste of crayons? Ours do the same thing! I never thought to tape the wrapping paper down! COOL idea! I am going to try this out! Thanks for the GREAT idea!